A Russian court has ordered a critic of President Vladimir Putin to be committed to a psychiatric hospital over clashes with police at a protest. The court ruled that Mikhail Kosenko was not responsible for his actions because he has a mental illness. Mr Kosenko was accused of rioting at a protest in Moscow in May last year, on the eve of Mr Putin's inauguration. Amnesty International called the ruling an "abhorrent return to the Soviet-era practices used to silence dissent". "Mikhail Kosenko is a prisoner of conscience put behind bars for peacefully exercising his right to protest and should be released immediately," said AI's Europe and Central Asia programme director John Dalhuisen. Mr Kosenko's sister, Kseniya, told the BBC it was "an awful feeling" when she heard he was being sent to a psychiatric ward. Speaking to Newsday, on World Service Radio, she said she did not know if she would be able to visit him. "What scares me most is that there is no access to him for human rights monitors. What I have read are really frightening stories about what goes on there and he will be put there indefinitely," she said. 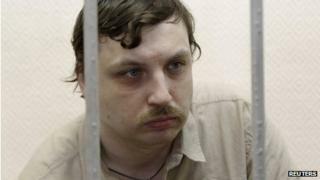 Mr Kosenko was diagnosed in 2001 with mild schizophrenia but his condition was controlled by medication and he had never shown any aggression, according to a statement from Human Rights Watch. Kseniya Kosenko describes her brother as "a very quiet, homely type of guy - he's a very shy person, shunning any kind of violence". "A conclusion by expert psychiatrists says that he is a danger to society and therefore should be isolated in a psychiatric facility," his lawyer Valery Shukhardin told AFP. "It's unclear to us where these conclusions come from. They are not justified by anything except the charges laid against him." Mr Shukhardin said the defence team would appeal against the sentence. Mr Kosenko is one of a dozen activists accused of mass disorder over the Bolotnaya rally, on 6 May 2012. It was the culmination of a wave of protests which began in December 2011, following Mr Putin's party's victory in parliamentary elections. Tens of thousands of people had marched to the square. Police say protesters turned on them with metal bars and flagstones. Opposition leaders say the authorities provoked the clashes.